The solicitations that went out the weekend of February 16th confirm the news: the relaunch of Joe’s Comics, the imprint that created Midnight Nation and Rising Stars, is officially underway with the first of what will be an entire line of new, original titles. TEN GRAND, the first title to come out from Joe’s Comics, will be published by Image Comics and officially debut May 1st, with a convention variant to be unveiled at C2E2 in Chicago the week before. The premise: Joe Fitzgerald was a mob enforcer until the day he met Laura, who convinced him to leave that world behind. Before quitting, Joe agrees to one last job, little realizing that the man he’s been sent to kill was deeply involved in demonlogy. He survives Joe’s attempt and comes after him, fatally wounding Joe and killing Laura. As he lies dying, an angelic force promises that if Joel agrees to work for them as a different kind of enforcer, they will bring him to life and keep on bringing him to life every time he is killed in a righteous cause. The reward: for those five minutes of death, he will be with Laura again. Would you endure an eternity of pain and death, dying over and over, to be with the woman you love for just five minutes each time you died? Most people might say no. But Joe Fitzgerald isn’t most people. The return of Joe’s Comics has been in the works for several years, awaiting the right time to go forth. 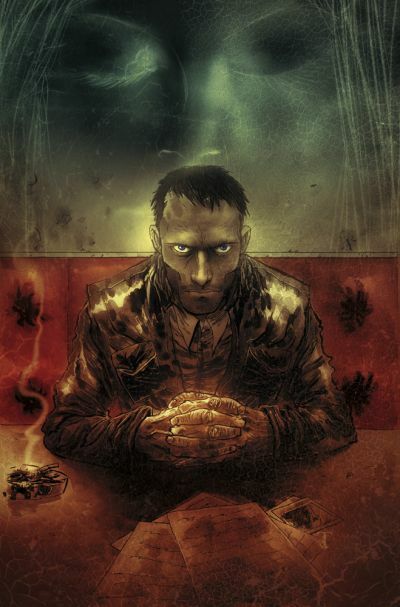 The art on TEN GRAND (interiors and covers) is being provided by Ben Templesmith, the New York Times best-selling Australian comic artist and writer most widely known for co-creating 30 Days of Night with Steve Niles and Fell with Warren Ellis. Straczynski spoke about TEN GRAND to MTVGeek , which also ran an exclusive preview of Templesmith’s interior art. Issues #1 and #2 will also feature variant covers by Bill Sienkiewicz as well as Phantom variants. Like the other Joe’s Comics titles, TEN GRAND will run in twelve-issue installments, with two to three months in between each installment to make any corrections and get ahead on finished books. In keeping with the innovation and experimentation that has been the hallmark of Joe’s Comics, readers will find a QR code in the back of the first issue that will lead them directly to an audio performance of the book’s dialogue by some of the top voice actors in the business, including Babylon 5 alumnus Robin Atkin Downes, Yuri Lowenthal and Tara Platt. TEN GRAND #1 is available for pre-order in the March issue of Previews. Ten pages of preview art can viewed on the Image Comics site, here. SIDEKICK, the second title to be launched from Joe’s Comics, will debut at Comic-Con International in San Diego with a convention variant. This will be followed in the fall by ALONE and PROTECTORS, INC. (artist announcements pending).